This pdf manual for the Sharp Projector PGLW3000. Actually, this manual also for the Sharp Projector with model like PG-LX3000, PG-LX3500 and PG-LW3500. Ok, as usual you can download the operation manual and troubleshooting guide at sharpusa.com. 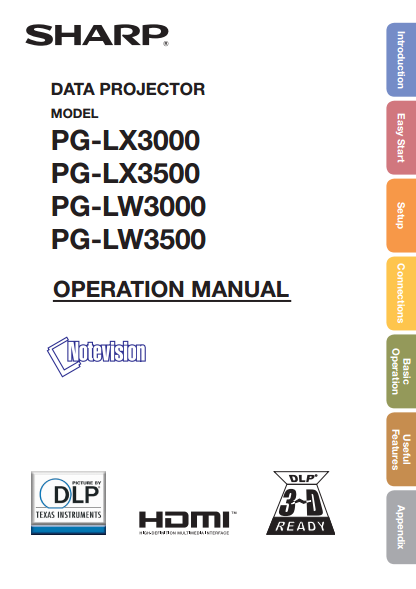 The Sharp Projector PGLW3000 User Manual contains many information for example about projector layout with key functions, setting up the projector, video setup, connections projector guide, learn how to using the projector (basic guide: step by step), using remote control, using features like using the menu screen, auto restart function, setting up the projector network environment like DHCP client setting, TCP/IP settings, restart network function, maintenance guide, troubleshooting and more.